Detached chain stitch is ideal for tiny leaves. 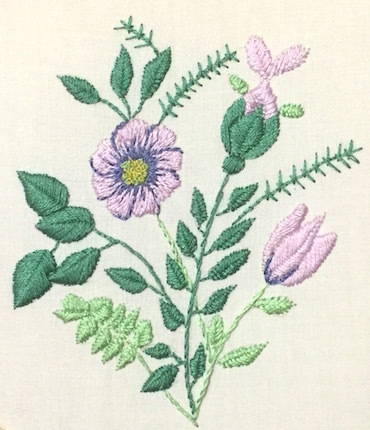 Also known as Lazy Daisy, it was one of the first embroidery stitches I learned as a child. In this sample, I made the leaves look spiky. To do this I lengthened the tie down stitch that holds the loop in place. You can find instructions for detached chain stitch by clicking on the link. 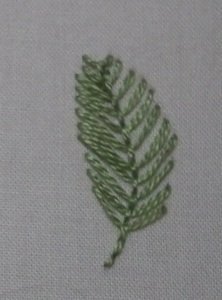 Fly stitch makes a delicate looking leaf, resembling a fern. 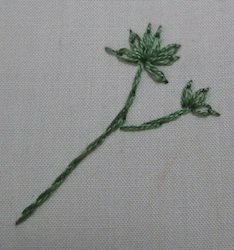 Continue the stem using backstitch after stitching the leaf. All you need to transfer to the fabric is the central vein/stem line. 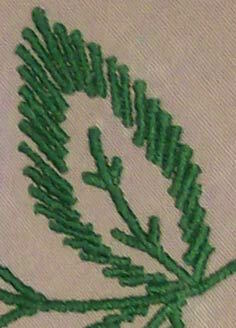 An outline of the leaf is best avoided, as it would show in the finished embroidery. Unless of course you use a disappearing ink pen, instead of an iron on transfer. You can see videos for fly and detached chain stitches by clicking the link. Buttonhole stitch is a versatile stitch when it comes to leaves. In this sample the corded edge gives a heavier outline to one side of the leaf. To me, it gives the impression of leaves folded in half, waiting to open when the sun shines. Backstitch forms a gentle outline on the other edge. 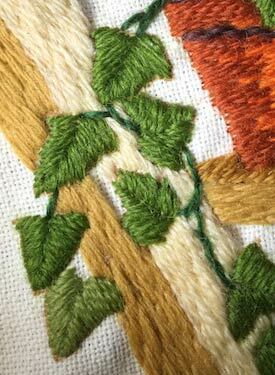 Stitched in rayon thread, these leaves have an effective sheen to them. The thread or fiber used can alter the appearance of the end result. I used crewel wool for the satin stitched ivy leaves in this next sample. I didn't stitch a vein in these leaves. Taking the needle down in the center just gives the impression that one is there. Angling the stitches helps to emphasize the shape of the leaves. Here is a more creative representation of a leaf. It uses Satin stitch again, but as narrow "bars" placed around the edges of the leaves. This gives a serrated effect. Working satin stitch across large leaves can cause a laundry nightmare! Long stitches are bound to get snagged, destroying the embroidery. This method avoids that danger. You could also use bullion knots in a similar way, if you want more texture in your project. Despite its name, fishbone stitch is ideal for embroidering leaves. It creates a vein down the center as you work. All the leaves in this floral design were stitched in raised fishbone. To give a solid leaf you can work the stitches close together. If you want to make a fern you can space them further apart. This stitch also makes wonderful feathers. Try it on both evenweave and closely woven fabrics. If you liked this page, and would like more like it, feel free to comment below.